Woke up about 7am after a pretty good sleep and on looking out the window it looked like a nice day, so it reinforced my plans to go to Australia Zoo. Having had breakfast and got resdy to go out etc I fed all the animals. The chicken I saved yesterday was looking fine this morning after its ordeal, so hopefully it will be alright. 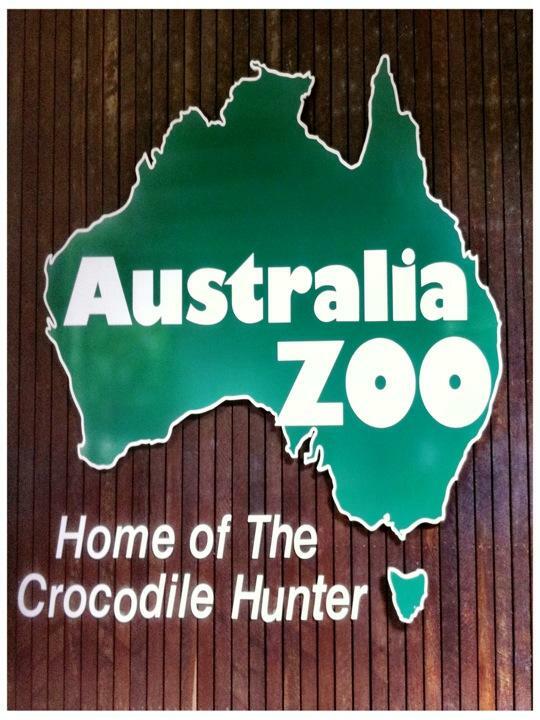 I got to Australia Zoo just before it opened at 9am, and qued up like everyone else. Having got in and seen the map you realise how big it is! There is a shuttle bus which you can hop on and off to take you round, but I only used it once when I was late for a show. - One of the first lot animals I saw near the reception were otters. They were really cool, all super excited running around and swimming in their enclosure. The Salt Water Crocodiles were absolutely unreal, it's hard to get an idea of just how big and powerful they are from just watching on TV. Seeing them at the show water was brilliant. - One of the best experiences of the day was the elephant feeding. Although it was a bit of a riot due to all the school kids and their families around, everyone who wanted to could line up and feed an elephant. I took loads of photos which tells the story better, but it was just such a cool experience you couldn't help but smile when they wrapped their trunk around your hand and too the food. Their trunks are unbelivably dexterous, they were actually throwing chunks of carrot etc up into their mouths, rather than just putting it in! - I watches the Crocodile feeding show in the 'Crocoseum', which like a football stadium design, but with a pool in the middle of the 'pitch'. Before the croc's were brought in though 'Bindi' Steve's daughter (who is about 14), did a little show for the kids. To be honest it was a little bit cringe-worthy watching her prance about over exadurating everything and talking constantly about her dad, but all the little kids seemed to like it so..
Once she had done her bit they brought in one of the big Salt Water performing Crocs. Steve's wife and a couple of the other keepers did the show which was really cool, getting the Croc jumping out the water for food etc. It was great to see the show I had seen Steve doing on TV back home, but with his wife and daughter doing it live. - The most eye opening experience of the day was seeing the Bengal Tiger. They are absolutely incredible beautiful and powerful animals, just amazing to watch. You couldnt help but feel something wasn't quite right about what you were seeing though; it was obviously captive bread, but seeing it in there with 2 keepers sat watching in the same enclosure close by, just made you think it should be out in the wild with 1,000,000 times the space it had in there..
-I also did the standard touristy thing of 'petting' a Koala and a Kangaroo. You weren't allowed to hold them, but I did get a photo of me stroking the Kolala and kneeling by a Roo. - One of the last things I saw before leaving were the snakes. It was really cool to see all the native snakes that live round here, but from the safety of being on the right side of an inch of glass! In that room they had a huge Python skelton in glass box wrapped around some tree branches, set up as if it was about to attack a pig skeleton. The one on display was 5m long, and it just looked incredibly huge, then I read that the biggest one ever found was about 10m... My mind = Blown. By 2:30pm I had seeing every last bit of the zoo, and was a bit tired from all the walking around, so decided to come home. Just on my way to the shop to buy a souvenir or 2 I saw a keeper walking a Wombat, but on a leash like a dog..mental! I got home and was just walking into the house, when I heard what sounded like a dying chicken.. Running down stairs I discovered another bloody Chicken in the garden, this time stuck between the railings to the pool, which it had obviously done in an attempt to escape Moose who was chasing it. THEY HAVE NO SELF PRESEVATION! Fortunately I pulled it out in one piece and chucked it back over the fence into the paddock, where it trotted off a little flustered. At this rate it will be 3rd time lucky to the dog, and I will be explaining to the family why a chicken is missing! Later in the afternoon I sat by the pool for the while listening to some music and chilling, then came inside when it cooled down a bit. I watched all the latest highlights from the Quik Pro in France again. It looks like its pumping over there, I wonder if Simon Meltzer is watching? I then spent the rest of the afternoon sorting out my Australia Zoo photos, and putting some on Facebook etc, which seemed to be pretty popular with home. In the evening I had some dinner then hired 'American Pie, The Reunion' on the TV box. It was absolutely hilarious, and actually better than I was expecting. Having put all the animals to bed etc I went to sleep about 10pm really tired..